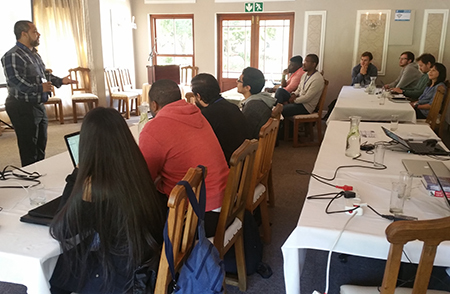 The North-West University (NWU) recently hosted the annual fair of the national Centre for Artificial Intelligence Research (CAIR), a national research network that supports capacity development and advanced research in Artificial Intelligence (AI). Managed by the Council for Scientific and Industrial Research (CSIR) and sponsored by the Department of Science and Technology, CAIR consists of nodes based at the universities of Cape Town, KwaZulu-Natal, Pretoria, Stellenbosch and North-West. The CAIR FAIR 2018 was held in Hermanus from 7 to9 November. This year, the theme was “Deep Learning”. 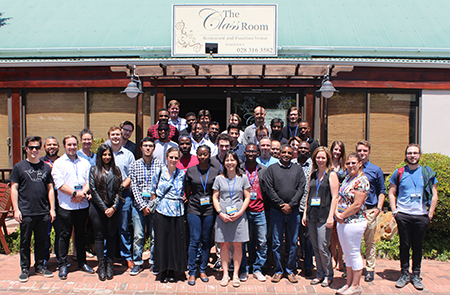 Prof Marelie Davel and Prof Etienne Barnard from Multilingual Speech Technologies or MuST, an AI-focussed research niche area at the NWU’s Faculty of Engineering, curated the three-day programme. The programme consisted of a set of introductory tutorials, a research symposium where researchers and students presented works in progress, and debates around scientific, social and philosophical issues related to deep learning and AI. The presentations covered diverse fields, ranging from theoretical research on deep neural networks, the utilisation of deep learning in space physics applications, and even the ethical implications of AI in social robotics and autonomous weapon systems. The response to the fair was so overwhelmingly positive that the node representatives agreed to investigate the feasibility of setting up an accredited version of the fair in 2019. This will enable the creation of a local platform for researchers and students in AI-related fields to present their work. Dr Quentin Williams, strategic research manager of the CSIR Meraka Institute, delivers the opening address at the CAIR FAIR 2018. Approximately 40 delegates attended the CAIR FAIR 2018.